A team of Baylor researchers now has a window into a broad variety of cellular processes thanks to a Major Research Instrumentation grant from the National Science Foundation. The grant provided over $240,000 for the acquisition of an electron paramagnetic resonance (EPR) spectrometer. Dr. Patrick Farmer, professor and chair of the department of chemistry & biochemistry in Baylor’s College of Arts & Sciences, is the principal investigator on the grant. He says the uses of the EPR device are wide-ranging, with potential benefits for faculty research as well as undergraduate and graduate education in a variety of fields including chemistry, biology and geosciences. EPR is used to detect unpaired, or “free,” electrons, yielding detailed information on the geometric and electronic structure of molecular and solid-state materials. Chemical species with unpaired electrons are known as “free radicals,” and they are involved in many important biomedical processes. 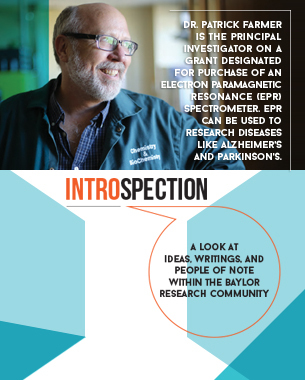 The presence of the EPR is not just a benefit to faculty and students who work on Baylor’s campus. The department of chemistry and biochemistry also utilizes the device as part of its Advanced Instrumentation Workshops, an outreach program that Farmer and his colleagues in the chemistry department have organized and hosted at Baylor for the last nine years. The EPR was a central component of the most recent workshop. Baylor faculty presented EPR theory in pre-lab sessions, then let students use the device to study simple compounds. Throughout its history, the Advanced Instrumentation Workshop has provided hundreds of students with hands-on, faculty-led instruction using Baylor lab equipment. The students and faculty come from institutions in New Mexico, Texas, Louisiana and Arkansas. Funds from a variety of Baylor sources including the Office of the Vice Provost for Research cover travel and lodging costs for visiting undergraduates and their faculty advisors. Nearly a third of students who have attended have been under-represented minorities and roughly half have been women.